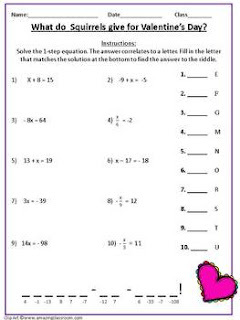 This is a handout that has students solve one-step equations to solve a riddle. The sheet has a riddle at the top of the page with instructions. There are blank spots at the bottom of the page that students will fill in to answer the riddle. First, the student solves the equation. Then, they find the letter that correlates with the value of x that they just found. After they have discovered which value correlates to which letter, they fill in the blanks to see the answer to the riddle. This would be a great activity to leave for a sub around Valentine's Day. It could also be used as a quick refresher at the beginning of class or an exit slip at the end of the day. There are 10 questions. The answer key is included. This item is a digital download from 4 the Love of Math. As such, it is for use in one classroom (or by one teacher) only. This item is bound by copyright laws and redistributing, editing, selling, or posting this item (or any part thereof) on the Internet are all strictly prohibited without first gaining permission from the author. Violations are subject to the penalties of the Digital Millennium Copyright Act.